Basic Bank Ltd Job Circular 2017 | www erecruitment bb org bd. Basic Bank job circular 2017 has been published at their official website and Bangladesh Bank website at www bb org bd. As well as national newspapers in Bangladesh. Basic Bank limited will recruit for the post of “Assistant Manager”. Interested and eligible candidates can apply through Bangladesh Bank official recruitment website www erecruitment bb org bd. 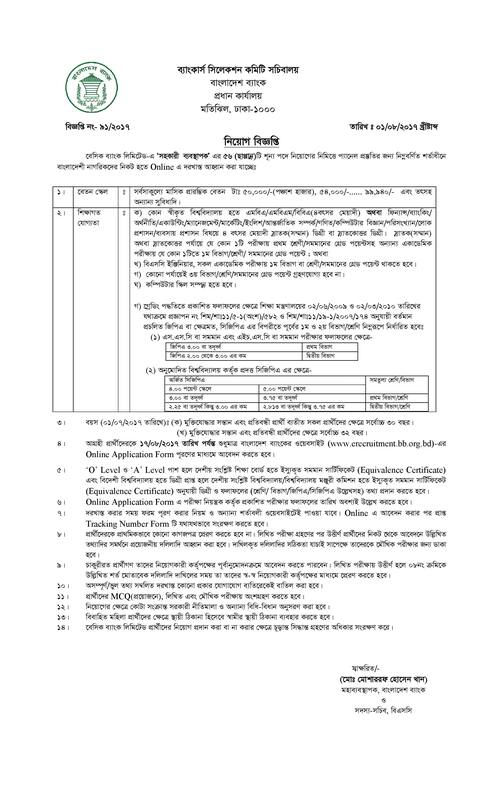 Bellow you have to see the details about Basic Bank job circular 2017. Here we will update Basic Bank Asst Manager MCQ exam date and time and Basic Bank MCQ exam result. As well as Basic Bank written exam result, viva schedule and result via Bangladesh Bankers selection Committee website. Let’s check the Basic Bank recruit circular advertisement bellow. MBA/MBM/Masters degree/ Four year honors degree from any Govt. approved university in Finance/ Banking/ Economics/ Accounting/ Management/ Marketing/ English/International Relations/Mathematics/ Statistics/ Computer Science/Public Administration/Business Administration with at-least one first division/class in Graduation or post Graduation and at-least one first division/class in other academic examination. BBA(Four year)/B.Sc. Engineering degree with first division/class in all academic examination. Third division/class in any examination is not allowed. . Applicant must have Computer Knowledge/Skill. Interested eligible candidates must apply online within this period. We will update here about Basic Bank job exam date and time for Assistant Manager. As well as MCQ exam result of Basic Bank, Written exam result and viva result.